Outdoor movie venues have become more and more popular in recent years. They allude to the outdoor movie screenings of the 60s, where couples would pull up in their cars and enjoy a movie under the sparkly stars. These types of venues offer the same movie experience as a movie theatre would, with more versatility for the viewers. Most of these venues project their movies onto an inflatable movie screen, which means they are easy to move and transport. In addition to movie venues, backyard party planners love to incorporate these screens in the event experience. 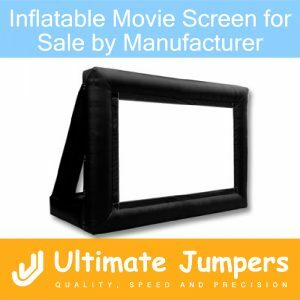 Thus, Ultimate Jumpers, Inc. offers an inflatable movie screen for sale by manufacturer in three different sizes. The Inflatable Mini Movie Screen is perfect for smaller spaces such as backyards. If you are an inflatable rental company, this size is perfect for house parties that need a backyard projection screen for a night. This size of the mini movie screen is 8 ft. by 4.5 ft., making it versatile and practical to include in your rental fleet. The Inflatable Large Movie Screen is perfect for slightly larger spaces that can accommodate larger crowds. It is 12 ft. 7.5 ft, giving the viewers a larger view of the screen. Finally, the largest inflatable movie screen for sale by manufacturer is the Inflatable Jumbo Movie Screen which measures an incredible 20 ft. by 11.5 ft.
All of the inflatable movie screen for sale by manufacturer have a warranty of 3 years. In addition, they are made with high quality, durable vinyl which makes them very dependable. If you are an inflatable rental company, consider adding an inflatable movie screen to your fleet. With the right marketing and promotions, they can provide a great return on investment for your business!